both station and repeater modes. Marc Chamberlin WA7PXW and Dave McClain N7AIG are finishing the FORTH dynamic-addressing experiment. Dave finished the 6809 target compiler for his Apple system, and Marc is rewriting the code he generated on the Point 4 TNC simulator to be compatible, and run on, the Apple. They hope to have this experiment on the air this fall. Elsewhere is this newsletter you'll find a report on protocol standardization which occurred at the special AMSAT packet radio meeting held in the first week of October. TAPR was represented by Den and Lyle, and was in complete agreement on the resulting "AMSAT standard". To this end, Margaret Morrison KV7D has embarked on an implementation, from scratch, of this protocol. Using 6809 assembler and PASCAL (UCSD standard), Margaret is targeting a fall release. The development system is a combination of DEC-10, VAX running VMS and H.P. 64000 workstations ... talk about the classy way to get things done! We are now working on a target delivery to Beta sites of TNC's next month, but we've learned to keep our mouths shut about promises and due dates. The St. Louis group (SLAPR), ably led by Pete Eaton WB9FLW and Bill Reed WDOETZ, have taken the task and responsibility of having the Beta schematic turned into a layout within the next three weeks, and have also found the mythical "custom transformer" that makes installation of a working TNC no more difficult than opening up the packing box and putting cables back on, installing a radio-dependent plug on the RF interface cable and trying it out. We hope Beta site coordinators will help in the integration of hardware for their areas. Final prices for complete packages will be sent to coordinators very soon; I think we're all in for a very pleasant surprise, due to some dogged arm-twisting by Lyle. 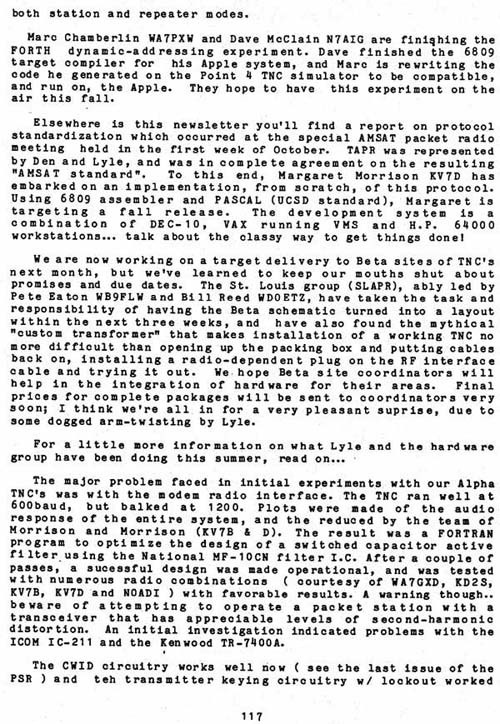 The major problem faced in initial experiments with our Alpha TNC's was with the modem radio interface. The TNC ran well at 600baud, but balked at 1200. Plots were made of the audio response of the entire system, and the reduced by the team of Morrison and Morrison (KV7B & D). The result was a FORTRAN program to optimize the design of a switched capacitor active filter using the National MF-10CN filter I.C. After a couple of passes, a successful design was made operational, and was tested with numerous radio combinations ( courtesy of WA7GXD, KD2S, KV7B, KV7D and N0ADI ) with favorable results. A warning though.. beware of attempting to operate a packet station with a transceiver that has appreciable levels of second-harmonic distortion. An initial investigation indicated problems with the ICOM IC-211 and the Kenwood TR-7400A.